Though in MOST situations you should think about your actions before you do them, sometimes the most important thing is NOT to think about it – just DO IT. I had one of those experiences yesterday and it taught me a great deal. I have never flown in a bush plane, or anything that small and was concerned how that was going to go for me during the race. 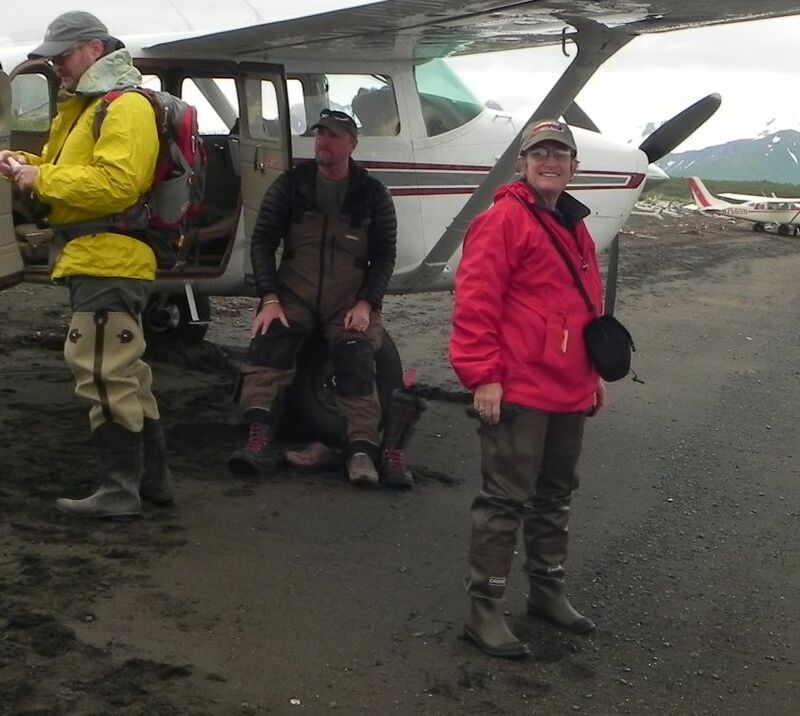 So I scheduled a bear viewing trip for my husband and me that required flying in a bush plane from Homer to the Alaskan Peninsula, about an hour and a half. Several times I started to think (read that WORRY) about the plane ride and then I forcefully pushed the thought out of my mind because I knew that would lead to panic and me bailing out of the opportunity. Well, I did manage to NOT THINK and just DO IT, and I am so glad I did. I would have missed one of the most amazing experiences of my life. With the knowledge and special understanding of our experienced bear guides we hiked for roughly three hours through a preserve where Grizzly Bear roam free and share a mutual respect of humans. 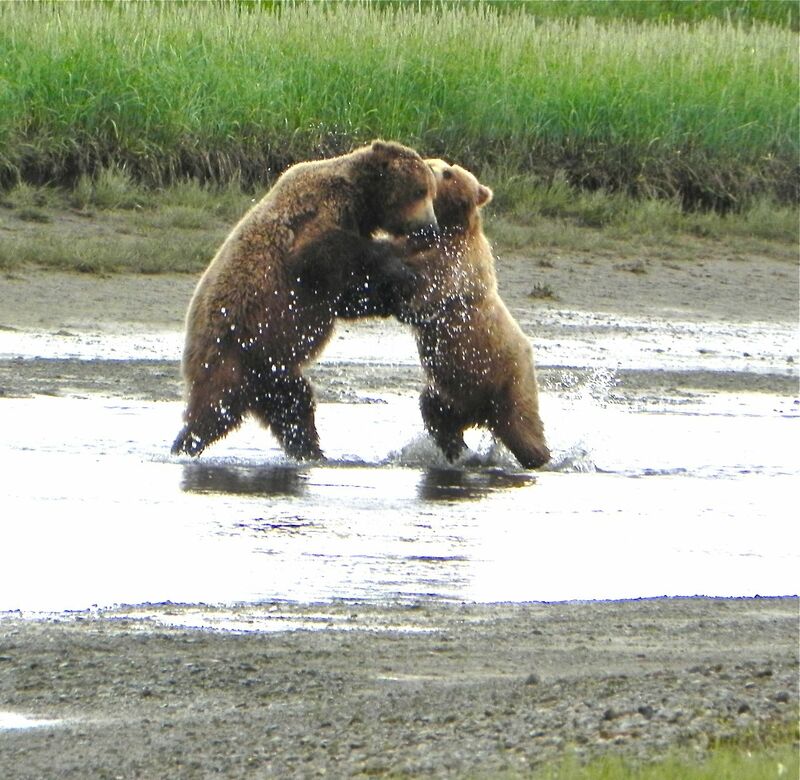 We were able to get very close to photograph bears interacting with each other and pretty much ignoring us. There were ten of us and two guides. We had to adhere to very strict rules and patterns of behavior, but the understanding we gained of these amazing creatures is invaluable. The picture I have included is literally of a bear dance – a very slow, affectionate play. You see what I would have missed! Sometimes don’t think too much, just DO IT. By the way, the plane ride was AWESOME!!! Challenge yourself every day – the rewards are worth it.